Newport Beach, California: Books On Tape, 1996. 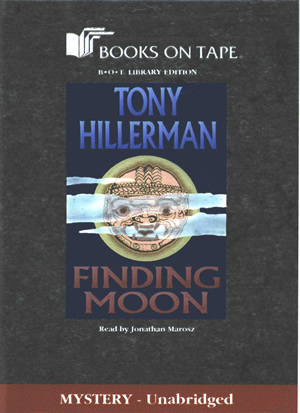 This is the Books On Tape library edition audiobook version of Finding Moon. Published in 1996, this unabridged version is read by Jonathan Marosz onto 7 cassettes of 1.5 hours each (total listening time 10.5 hours). The cassettes are in a white hard plastic case with a wraparound gray faux stone background. The book title and author are printed on the front cover within a navy blue rectangle. Between them is a drawing of stylized decorated face partially obscured by thin clouds seeming to drift across it. On the back of the case is a synopsis of the novel and publisher information.